1.3 Do box jellyfish have colour vision? Nearly all living organisms are capable of light sensing, that is, responding to electromagnetic radiation in the range of 300-800 nm. Studying visual systems is fascinating from the evolutionary point of view because animals which are very distant from each other on the tree of life seem to have developed surprisingly similar, sometimes very complex machinery that allows them to sense light. Of particular notice is the visual system of the box jellyfish (Class Cubozoa, Phylum Cnidaria) (Figure 1): it is the most elaborate cnidarian visual system. The eyes of these beautiful aquatic animals are very similar to our own! The exceptional vision of the members of the Cubozoa class (the smallest class in the phylum Cnidaria) was detected when it was noticed that they demonstrate unexpectedly complex swimming behaviours: they can move very fast in specific direction and avoid dark areas and obstacles. Figure 1: Tripedalia cystophora, a box jellyfish from the Caribbean Sea. There is a number of experimental procedures that allow scientists to study how box jellyfish see. For example, by controlling lighting conditions in experimental chambers where animals are tethered one can observe changes in pulse frequency, contractions and structural asymmetry of the bell of the jellyfish which would translate into avoidance and approach swimming behaviours in free animals. In the past decades the nervous system of the box jellyfish including visual system has been studied from anatomical, cellular, molecular and genetic perspectives but the knowledge of the elaborate eyes of these creatures is still incomplete. Box jellyfish has its name for the cube-like shape of its bell, which is about 10 mm in diameter in adult animals. On each side of the bell are situated the four rhopalia – sensory structures that accommodate in total 24 eyes of various types. Such positioning of the visual organs allows Cubomedusae to have a nearly 360-degree view of the surrounding! Remarkably, their eyes do not look outside but inside of the medusa (i.e. at each other!) but thanks to the transparency of the bell can still see in all directions. Jellyfish lack the ability to control eye position with muscles, so rhopalia maintain the same natural orientation independent of the orientation of the bell with the help of the crystal structure in the bottom called statolith that acts as a weight and the flexible stalk on top that connects them to the bell. The six eyes in the rhopalia are of four different morphological types (Figure 2): upper and lower complex lens human-type eyes (ULE and LLE) at the vertical midline, and paired simple eyes with light-sensitive pigment only on each side, called pit and slit eyes (PE and SE). Although cnidarians are radially symmetrical organisms, the nervous system inside their rhopalia is bilaterally symmetrical, except the midline positioning of the lens eyes. The stalk with a rhopalial nerve inside serves as connection between a rhopalium and the ring nerve at the bell margin which in turn is connected to the nerve net, forming together the complete nervous system of the box jellyfish. Non-neuronal cells include ciliated photoreceptor cells responsible for the initial light sensing, balloon cells of unidentified function and posterior cell sheet - the largest cell population of undifferentiated cells which are possibly associated with the nervous system. The lens eyes of box jellyfish are astonishingly similar to our own due to the presence of the camera with vitreous body separating the lens and the retina (hence the name “camera eye”). The lens eyes are known to have poor spatial resolution because the retina is very close to the lens separated only by thin vitreous space (around 8 μm in the lower lens eye, absent in upper lens eyes) with focal length of the lens falling far beyond the retina (between 400-600 μm). In humans, by contrast, the size of the camera is about 23 mm. Using a special procedure during which an electrode placed in the eye records activity of cells there in response to various visual stimuli called electroretinography, the temporal properties of the upper and lower lens eyes have also been determined. Both eye types have low temporal resolution but their response patterns differ suggesting that they are utilized for different visual tasks. For example, the maximum frequencies that can be resolved from the electroretinograms (also called flicker fusion frequencies) by the upper and lower lens eyes were reported to be 10 and 8 Hz, respectively. Apart from that, the two lens eyes have different visual fields covering different areas of the surroundings. Overall, it seems plausible that eyes of the box jellyfish are fine tuned to perform specific tasks which in turn allows filtering of the visual stimuli already in the rhopalia. Do box jellyfish have colour vision? A curious question is whether members of the Cubomedusae order have colour vision like more advanced vertebrate organisms including us do. There are two types of photoreceptors in the animal kingdom: ciliary, usually present in vertebrates, and rhabdomeric, found in invertebrates. Interestingly, box jellyfish possess vertebrate-like ciliary photoreceptors. Although both types rely on the same chemical conversion of the retinal molecule upon exposure to light (i.e. bleaching), they differ in the mechanism, structure, origin and molecular pathways. The type of receptors in the retinas of both upper and lower lens eyes are normally sensitive to the blue-green light with peak absorbance between 465-508 nm depending on a species. The available data to date therefore suggests that box jellyfish might be sensitive to green light although experiments in green colour-guided obstacle avoidance produced inconclusive results. Colour vision would be a useful adaptation for these animals living in shallow water with lots of flickering light at the surface ripples to discern the luminance (i.e. brightness, intensity) noise from relevant visual stimuli, as colour vision is less sensitive to luminance fluctuations. To date, only the importance of the lower lens eyes for the control of swimming behaviour has been experimentally established, including their role in bell contraction rates which modulate the speed of the moving animal. Notably, the optical power of lens eyes varies between species of the Cubomedusae introducing further variability. The role of slit and pit eyes in pacemaker activity (pulsating movement of the bell) and control of swimming direction remains somewhat unclear and can be elucidated in future experiments where specific eye types are selectively made non-functional. It is also not entirely clear how integration of the visual input occurs in the nervous system of the box jellyfish. Response to visual stimulus was detected both in the stalk (an extension of the nerve ring) as well as the nervous system of the rhopalium itself. The association of specific neuronal cells with certain eye types within the rhopalia signifies that some but not all information processing and integration occurs within these structures. Perhaps the speed of swimming which depends on the rate and strength of the contractions of the body and tentacles of the jellyfish is controlled by the pacemaker activity of a distinct neuronal population that is responsible for higher-order processing and integration of the visual information. Flank and giant neurons might serve this function. The fine steering might in turn be controlled through independent signalling and asymmetrical contraction of the different sides of the bell. Genetically, the visual system of the box jellyfish also appears to be more closely related to that of vertebrates rather than invertebrates, because they share several critical components of the molecular pathways underlying light sensing (for example, phosphodiesterases needed for phototransduction and protective pigment-producing machinery in the retina). The bilateral organisation of the rhopalium nervous system (with the exception of the retina associated neurons) in the otherwise radially symmetrical jellyfish could be the evidence that cnidarians evolved from a bilaterally symmetrical ancestor, but the use of the ciliary photoreceptors and melanogenic pathway by both box jellyfish and vertebrates could mean either common ancestry or independent parallel evolution. Further investigation of the extraordinary visual system of the box jellyfish would therefore be helpful in solving the riddle on the evolutionary origin of the advanced camera eyes. One of the most interesting non-primate is the octopus. The most interesting feature about this non-primate is its arm movement. In these invertebrates, the control of the arm is especially complex because the arm can be moved in any direction, with a virtually infinite number of degrees of freedom. In the octopus, the brain only has to send a command to the arm to do the action—the entire recipe of how to do it is embedded in the arm itself. 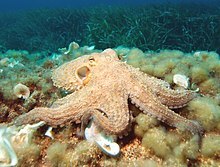 Observations indicate that octopuses reduce the complexity of controlling their arms by keeping their arm movements to set, stereotypical patterns. To find out if octopus arms have minds of their own, the researchers cut off the nerves in an octopus arm from the other nerves in its body, including the brain. They then tickled and stimulated the skin on the arm. The arm behaved in an identical fashion to what it would in a healthy octopus. The implication is that the brain only has to send a single move command to the arm, and the arm will do the rest. In this chapter we discuss in detail the sensory system of an octopus and focus on the sensory motor system in this non-primate. The Common Octopus, Octopus vulgaris. Octopuses have two eyes and four pairs of arms, and they are bilaterally symmetric. An octopus has a hard beak, with its mouth at the center point of the arms. Octopuses have no internal or external skeleton (although some species have a vestigial remnant of a shell inside their mantle), allowing them to squeeze through tight places. Octopuses are among the most intelligent and behaviorally flexible of all invertebrates. The most interesting feature of the octopuses is their arm movements. For goal directed arm movements, the nervous system in octopus generates a sequence of motor commands that brings the arm towards the target. Control of the arm is especially complex because the arm can be moved in any direction, with a virtually infinite number of degrees of freedom. The basic motor program for voluntary movement is embedded within the neural circuitry of the arm itself. In the hierarchical organization in octopus, the brain only has to send a command to the arm to do the action. The entire recipe of how to do it is embedded in the arm itself. By the use of the arms octopus walks, seizes its pray, or rejects unwanted objects and also obtains a wide range of mechanical and chemical information about its immediate environment. Octopus arms, unlike human arms, are not limited in their range of motion by elbow, wrist, and shoulder joints. To accomplish goals such as reaching for a meal or swimming, however, an octopus must be able to control its eight appendages. The octopus arm can move in any direction using virtually infinite degrees of freedom. This ability results from the densely packed flexible muscle fibers along the arm of the octopus. Observations indicate that octopuses reduce the complexity of controlling their arms by keeping their arm movements to set, stereotypical patterns. For example, the reaching movement always consists of a bend that propagates along the arm toward the tip. Since octopuses always use the same kind of movement to extend their arms, the commands that generate the pattern are stored in the arm itself, not in the central brain. Such a mechanism further reduces the complexity of controlling a flexible arm. These flexible arms are controlled by an elaborate peripheral nervous system containing 5 × 107 neurons distributed along each arm. 4 × 105 of these are motor neurons, which innervate the intrinsic muscles of the arm and locally control muscle action. Whenever it is required, the nervous system in octopus generates a sequence of motor commands which in turn produces forces and corresponding velocities making the limb reach the target. The movements are simplified by the use of optimal trajectories made through vectorial summation and superposition of basic movements. This requires that the muscles are quite flexible. The eight arms of the octopus are elongated, tapering, muscular organs, projecting from the head and regularly arranged around the mouth. The inner surface of each arm bears a double row of suckers, each sucker alternating with that of the opposite row. There are about 300 suckers on each arm. The arms perform both motor and sensory functions. The nervous system in the arms of the octopus is represented by the nerve ganglia, subserving motor and inter-connecting functions. The peripheral nerve cells represent the sensory systems. There exists a close functional relationship between the nerve ganglia and the peripheral nerve cells. Acetabulo-brachial muscles (connects the suckers to the arm muscles). Each of these three groups of muscles comprises three muscle bundles at right angles to one another. Each bundle is innervated separately from the surrounding units and shows a remarkable autonomy.In spite of the absence of a bony or cartilaginous skeleton, octopus can produce arm movements using the contraction and relaxation of different muscles. Behaviorally, the longitudinal muscles shorten the arm and play major role in seizing objects carrying them to mouth, and the oblique and transverse muscles lengthen the arms and are used by octopus for rejecting unwanted objects. Cross section of an octopus arm: The lateral roots innervate the intrinsic muscles, the ventral roots the suckers. Six main nerve centers lie in the arm and are responsible for the performance of these sets of muscles. The axial nerve cord is by far the most important motor and integrative center of the arm. The eight cords one in each arm contains altogether 3.5 × 108 neurons. Each axial cord is linked by means of connective nerve bundles with five sets of more peripheral nerve centers, the four intramuscular nerve cords, lying among the intrinsic muscles of the arm, and the ganglia of the suckers, situated in the peduncle just beneath the acetabular cup of each sucker. All these small peripheral nerves contain motor neurons and receive sensory fibers from deep muscle receptors which play the role of local reflex centers. The motor innervation of the muscles of the arm is thus provided not only by the motor neurons of the axial nerve cord, which receives pre-ganglionic fibers from the brain, but also by these more peripheral motor centers. The arms contain a complex and extensive sensory system. Deep receptors in the three main muscle systems of the arms, provide the animal with a widespread sensory apparatus for collecting information from muscles. Many primary receptors lie in the epithelium covering the surface of the arm. The sucker, and particularly its rim, has the greatest number of these sensory cells, while the skin of the arm is rather less sensitive. Several tens of thousands of receptors lie in each sucker. Three main morphological types of receptors are found in arms of an octopus. These are round cells, irregular multipolar cells, and tapered ciliated cells. All these elements send their processes centripetally towards the ganglia. The functional significance of these three types of receptors is still not very well known and can only be conjectured. It has been suggested that the round and multipolar receptors may record mechanical stimuli, while ciliated receptors are likely to be chemo-receptors. The ciliated receptors do not send their axons directly to the ganglia but the axons meet encapsulated neurons lying underneath the epithelium and make synaptic contacts with the dendritic processes of these. This linkage helps in reduction of input between primary nerve cells. Round and multipolar receptors on the other hand send their axons directly to the ganglia where the motor neurons lie. Behavioral experiments suggest that information regarding the movement of the muscles does not reach the learning centers of the brain, and morphological observations prove that the deep receptors send their axons to peripheral centers such as the ganglion of the sucker or the intramuscular nerve cords. The information regarding the stretch or movement of the muscles is used in local reflexes only. When the dorsal part of the axial nerve cord that contains the axonal tracts from the brain is stimulated by electrical signals, movements in entire arm are still noticed. The movements are triggered by the stimulation which is provided and is not directly driven by the stimuli coming from the brain. Thus, arm extensions are evoked by stimulation of the dorsal part of the axial nerve cord. In contrast, the stimulation of the muscles within the same area or the ganglionic part of the cord evokes only local muscular contractions. The implication is that the brain only has to send a single move command to the arm, and the arm will do the rest. A dorsally oriented bend propagates along the arm causing the suckers to point in the direction of the movement. As the bend propagates, the part of the arm proximal to the bend remains extended. For further conformations that an octopus arm has a mind of its own, the nerves in an octopus arm have been cut off from the other nerves in its body, including the brain. Movements resembling normal arm extensions were initiated in amputated arms by electrical stimulation of the nerve cord or by tactile stimulation of the skin or suckers. It has been noted that the bend propagations are more readily initiated when a bend is created manually before stimulation. If the fully relaxed arm is stimulated, the initial movement is triggered by the stimuli, which follows the same bend propagation. The nervous system of the arm thus, not only drives local reflexes but controls complex movements involving the entire arm. These evoked movements are almost kinematically identical to the movements of freely behaving octopus. When stimulated, a severed arm shows an active propagation of the muscle activity as in natural arm extensions. Movements evoked from similar initial arm postures result in similar paths, while different starting postures result in different final paths. As the extensions evoked in denervated octopus arms are qualitatively and kinematically similar to natural arm extensions, an underlying motor program seems to be controlling the movements which are embedded in the neuromuscular system of the arm, which does not require central control. ↑ G. S. et al., Control of Octopus Arm Extension by a Peripheral Motor Program . Science 293, 1845, 2001. ↑ Y. Gutfreund, Organization of octopus arm movements: a model system for study- ing the control of flexible arms. Journal of Neuroscience 16, 7297, 1996. ↑ P. Graziadei, The anatomy of the nervous system of Octopus vulgaris, J. Z. Young. Clarendon, Oxford, 1971. ↑ M. J. Wells, The orientation of octopus. Ergeb. Biol. 26, 40-54, 1963. This page was last edited on 12 January 2018, at 10:01.